Spaceheads have augmented themselves to a trio for their new album Laughing Water, inviting Vincent Bertholet on double bass to join their trumpet and drums duo to record an album that's been eleven years in the making. It bears all the hallmarks of Spaceheads previous albums but the addition of Bertholet brings different nuances to the record which at points feels like they're making a commercial grab whilst at others sees them retreat further into delicate jazz-tinged improvisations that were captured at the moment of creation never to be repeated in that way. Laughing Water opens with the title track and the sound of running water and effects that imitate the sound of laughter. What's also immediately obvious on this opening track is that it is more overtly cloaked in pop tones and less experimental than previous offerings. Its signature trumpet line alone could form the hook of something that could fill a dancefloor. Dark Blue is a little more laid back in demeanour, the soundtrack to a 3am lock in down in a smoke filled Soho jazz basement, the trumpet off in the near distance winding its merry way through the cloudy haze of drums and double bass. Be Calmed has that warming fuzzy crackle of a not quite tuned radio running through it and sampled foreign radio stations over a simple repeated drumbeat and again brass that feels somewhat distant, close enough to hear but not see. Quantum Shuffle feels a little more restrained than what's gone before, an arm around the shoulder rather than trying to blow you away, perfect for a late night whisky fuelled comedown. The two and a half minutes of Octopus is even more understared, the trumpet dancing its way tiptoe over an almost not there backing. Machine Molle sounds like just that, the sounds of excited chattering machines coming together on loop, again with sampled vocals starting underneath the music but the repeated mantra of "everybody needs peace in the world" gradually taking over. Pedalo Power similarly has sampled vocals but they're mangled beyond recognition as the brass drops in and out obliviously around it. The six minutes of Aire De Rhone bring the album to its end, the time spent building very slowly and intricately, like the most modest of background music, hardly there but strangely intoxicating before disappearing to the sound of police sirens. 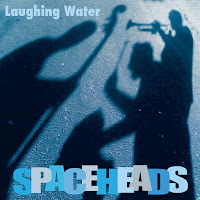 Laughing Water will be loved by the small and dedicated fanbase that the Spaceheads have around the globe. For the casual listener willing to open their ears and minds, there's also plenty here to dive into, nuances that become evident on further investigation. It might not be a record that you'll pick up and play all the time, but it's one that will capture a moment and a mood and be the perfect accompaniment to it. Spaceheads official website can be found here, and they are also on Facebook and Twitter. Andy also has his own Facebook and Twitter. Laughing Water can be purchased, along with the other Spaceheads albums from their Bandcamp site.